On Thursday, Kylie Jenner will prepare Thanksgiving dinner for her sprawling family at one of her four Los Angeles County houses. Wednesday was occasion for her to look back on another dressy occasion she'd shared with her four siblings. 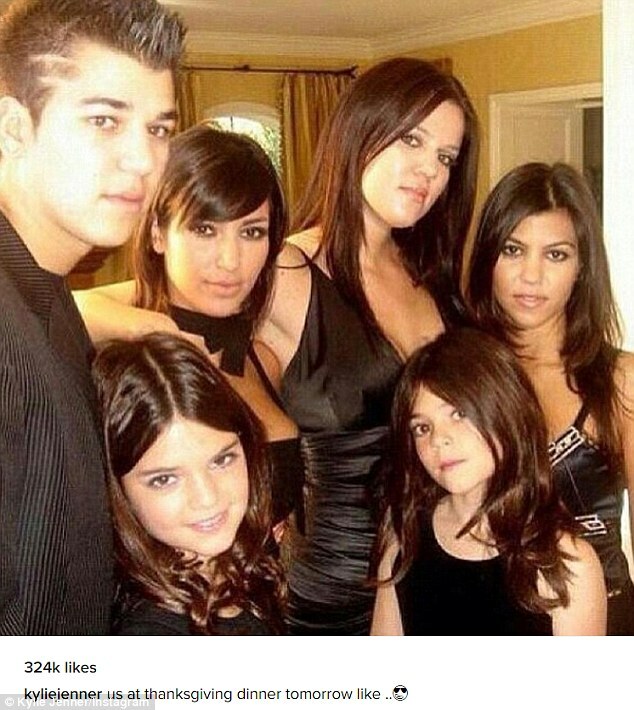 An Instagram photo showed the entire quintet - Kim, Kourtney, Khloé and Rob Kardashian, as well as Kylie and Kendall Jenner - posing for the camera roughly a decade past. The Jenner sisters, in particular, seemed even younger than they appeared when Keeping Up With The Kardashians aired its first series in 2007. All three Kardashian sisters wore cleavage-baring black outfits, Kim's look including the added touch of a bow tie about her bare neck. Her hair also had a distinct fringe. Although Kourtney barely appears to have aged a day since the photo was taken, the other Kardashians showed just how much they have changed. Meanwhile, Rob was wearing a black and white pinstriped suit, his hair spiked upward as a smiling Kendall leaned against him. Kylie's caption vamped: 'Us at thanksgiving tomorrow like ..' before throwing in an emoji of a face wearing sunglasses. It was the 37-year-old who'd revealed this year's Thanksgiving hostess during an appearance on the Amazon series Style Code Live early in November. The mother of three had been busy on social media herself, updating her Snapchat in the run-up to Thanksgiving dinner. 'Date with my little lady' was written in green over a post that showed paintbrushes and watercolours strewn about a white table. 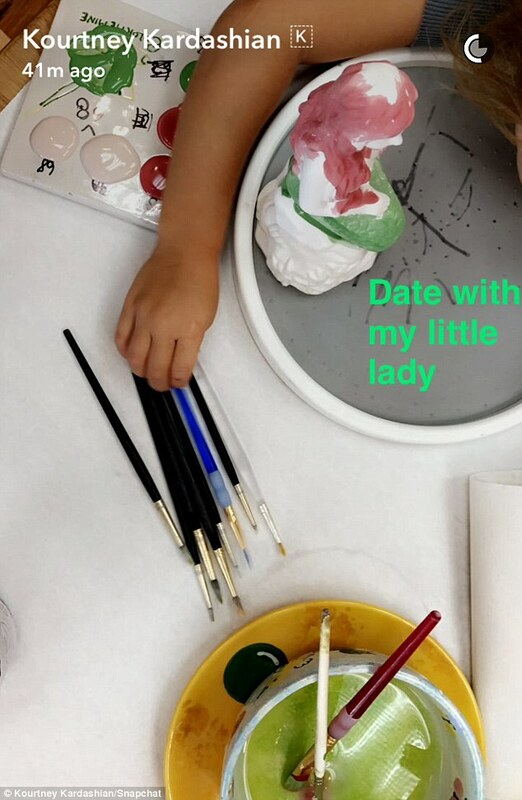 Penelope, Kourtney's four-year-old middle child and only daughter by Scott Disick, was partly visible, her arm reaching out for one of the brushes. 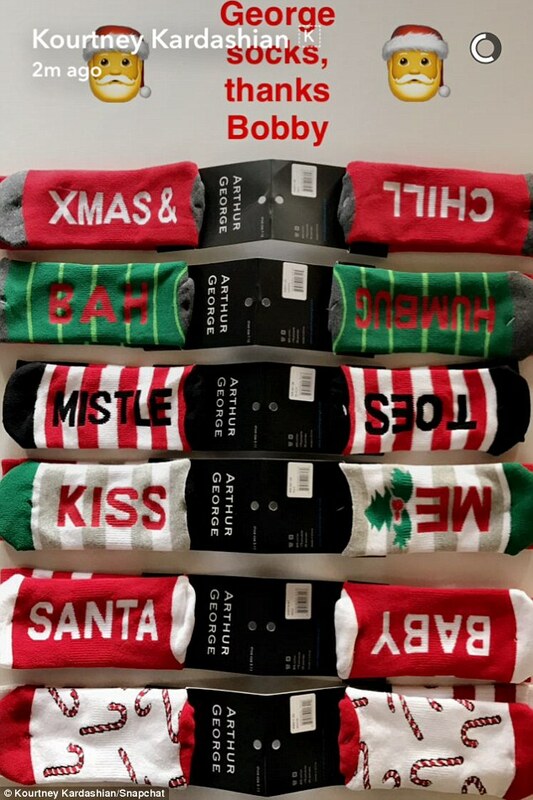 Like her youngest sibling, Kris Jenner's firstborn was in the mood for a bit of cross-sibling promotion as well. 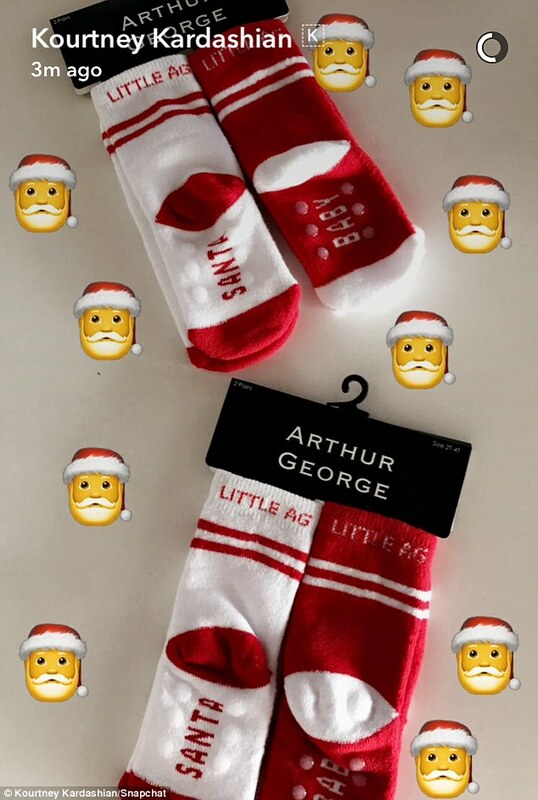 Emojis of Father Christmas were splattered about each of the posts, and one of them offered a 'thanks Bobby' for the extensive collection.